Jaylen Nowell scored a game-high tying 26 points and Matisse Thybulle added a season-high 18 on a night when Noah Dickerson was limited to 13 before fouling out. Washington pushed No. 1 Gonzaga to the brink, but lost 81-79 at the end when Bulldogs star Rui Hachimura sank a game-winning jumper with 0.6 seconds left. The Zags (8-0) have won four straight against UW, including 12 of the past 13 in the cross-state rivalry. The Huskies (6-3) fell to 2-29 against No. 1-ranked teams. Three impressions from the game. The Huskies, who trailed 40-30 at halftime, outscored the Bulldogs 49-41 in the second half in large part due to Nowell, who saved his best for the final minutes. The 6-foot-4 sophomore guard scored 16 of his game-high tying 26 points in the second half when he converted 6 of 12 shots, including a pair of three-pointers. For the game, Nowell made 10 of 18 shots and finished with six assists in 38 minutes. 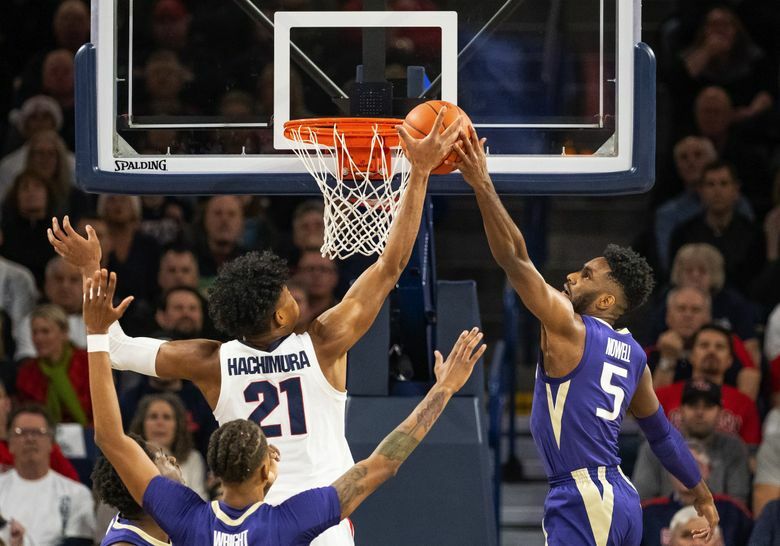 The Huskies needed a big night from their leading scorer because senior forward Noah Dickerson was saddled with foul trouble and smothered whenever he touched the ball in the post. He finished with 13 points and five turnovers in 26 minutes. Nowell was at his best when he was attacking GU’s defense and creating scoring opportunities for teammates. If not for Hachimura’s game-winner, Nowell might have been the game’s star. He sank a pair of free throws that tied the game at 79-79 with 9.4 seconds left. Nowell and Dickerson can’t carry the Huskies all season. Some nights, one or both of Washington’s stars will struggle offensively. And when that happens, UW has to find alternative scoring options. On Wednesday, defensive ace Matisse Thybulle delivered a season-high 18 points and looks to have emerged from a season-long scoring slump. It was just the second time this season Thybulle scored in double figures. The athletic 6-5 guard scored off dribble drives to the basket and perimeter shots (3 of 6 on three-pointers). He also had four assists and two steals. However, it was a quiet night for the rest of the Huskies. Hameir Wright, who started over Sam Timmins, appeared hesitant to take a shot behind the arc, where he converted 1 of 3. He fouled out with five points in 14 minutes. David Crisp had an uneven performance and finished with nine points on 3-for-7 shooting, four assists, three rebounds and two turnovers. Nahziah Carter and Jamal Bey didn’t give UW much off the bench in limited minutes while Dominic Green made 2 of 6 three-pointers in six minutes. The Huskies lost their first game of the season and fell to 11-2 in the past two seasons when he makes at least two behind the arc. Washington ranks No. 61 in the NCAA’s NET ranking and the Huskies will have few opportunities to capture a statement win in their remaining four non-conference games to rise in the rankings. UW plays Seattle University on Sunday followed by a game against Virginia Tech at the Boardwalk Classic in Atlantic City, N.J. The Huskies finish with tuneups at home against Sacramento State and Cal State Fullerton before their Jan. 5 Pac-12 opener against Washington State. There’s temptation to believe that if the Huskies play the way they did Wednesday, then they can beat anybody on their schedule. There’s plenty that made coach Mike Hopkins smile. UW committed just one turnover in the second half. The defense held a prolific GU offense to 17 points fewer than its average. And Washington showed fight and grit while overcoming a 14-point deficit. But Hopkins has also got to be concerned about a front line that was overpowered by Hachimura and Brandon Clarke, who combined for 12 of GU’s 14 offensive rebounds. And UW’s vaunted defense allowed another game-winning shot in the final seconds. Two weeks ago, Minnesota made a three-pointer at the buzzer to beat Washington 68-66 in the Vancouver Showcase.